For years, dentists and patients alike have made do with tooth replacement solutions that only restored the parts of the tooth you see when you smile. Dental implants are the only restoration options that replace the tooth roots as well as the crowns of lost teeth, delivering the closest to natural end results. 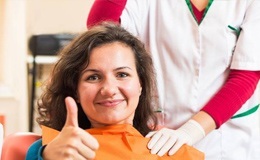 While many patients still don’t know much about dental implant supported tooth replacement, they have quickly become the gold-standard in care. On this page, we’ll walk through some of the many reasons why a dental implant tooth replacement plan may offer superior smile repair. To find out more about your specific dental implant tooth replacement options, call your trusted St. Louis dentist, Stewart E. Moreland, DMD, and his team to schedule a tooth replacement consultation appointment. If you used a traditional fixed bridge, partial, or full denture to repair your smile, you would need to repair or replace your restoration every ten years at most. An implant-retained crown, bridge, or denture will last for two or three decades on average, and some patients are able to keep their newly repaired smiles in place for the rest of their lives with proper care. Because the dental implant posts mimic the function of healthy tooth roots, your restoration is fully self-supporting. This helps to improve your oral health in two main ways. First, the stimulus from the replacement tooth roots preserves healthy bone and gum tissue. Without this stimulus, the body redirects the nutrients necessary to maintain bone and gum tissue to other parts of the body and starts to resorb these oral structures. This can change the shape of your facial structures, leading to serious oral health concerns. Second, the dental implants provide full support for the replacement teeth, so you don’t need to worry about damaging surrounding healthy teeth or oral structures. This can happen when traditional tooth replacement prosthetics are placed as they rely on these surrounding structures to provide the necessary support to hold the dental restoration in place. Instead, your dental implant restorations will be fully self-supporting, protecting healthy structures for improved overall oral health. Self-supporting restorations are important because they ensure you have a smile that functions like your own, healthy teeth. Traditional bridges require the removal of healthy tooth structure to provide support, and traditional partial and full dentures place a lot of pressure on bone and gum tissue that can lead to that sagging facial shape around the mouth that is so often associated with denture wearers. 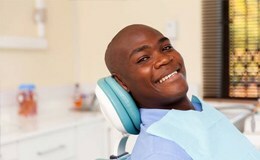 Your implant restoration ensure you stay looking your very best. Once in place, your dental implant supported replacement tooth will look, feel, and function just like your healthy, natural smile. That means you’ll have the confidence to speak and smile in every situation. You can also eat all of your favorite foods without worrying about damaging your replacement tooth or unseating a slipping denture. Finally, the natural-feeling structures are easy to care for at home with regular brushing just like your healthy smile.